MCUs blue colored IBM punch card machine from the 700 series, blank cards are placed in machine, buttons are pressed by male employee. Good MS woman in computer room, first monitoring the reel-to-reel tape drive, then checking on the massive printer in action. MS machine punching cards. MCU printer printing out graphs. CU punch card machine in action. MCU printer. MS young man operating punch card machine, placing stack of fresh cards in machine, removing stack of finished cards. MS two young men in computer room, one changes circuit board, the other monitors the machine. MCU of reels spinning on the "IBM 704" tape drive. MS man in computer filled with the massive equipment of the IBM 704 data processing computer, first he placed cards into the punch machine then pushes button on the tape drive. Nice MS young woman dressed in white angora sweater storing a magnetic reel in cubby next to an IBM 729 tape drive. Several MSs two women monitoring room filled with punch card machines, changing reels. MS two men in computer room, standing in front of massive control panel, they monitor codes & flip switches. MS woman in computer room, first she pushes button on the reel-to-reel tape drive, then walks over to monitor the massive printer in action. MCU woman monitoring the printer in action. MCUs "IBM" font on top of blinking data processing control panel. MCU data processing control panel with rows of flashing lights. Abstract CU blinking lights on data processing control panel, white lights against black BG. MCU data processing control panel with lights blinking. MS two men in business suits working inside colorful computer room outfitted with the latest in IBM computer systems. CU man flipping switches & pressing buttons on the 704 operator's panel. GV men inside computer room, showing the IMB 704 (housed in red) with all its 700 series components including: 711 Punched Card Reader (housed in blue), 716 Alphabetic Printer (housed in yellow), 721 Punched Card Recorder (housed in yellow), 727 Magnetic Tape Unit (housed in black). GVs men in business suits working inside colorful computer room outfitted with the latest in IBM computer systems including: the IMB 704 Electronic Analytical Control Unit (housed in red), 711 Punched Card Reader (housed in blue), 716 Alphabetic Printer (housed in yellow), 721 Punched Card Recorder (housed in yellow), 727 Magnetic Tape Unit (housed in black). 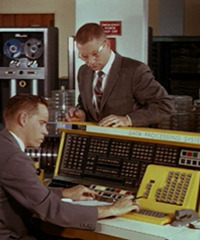 GV computer room with young man in suit seated behind the IBM 702 Central Processing Unit operator's console (housed in yellow), pushing buttons, woman walks into scene carrying magnetic tape reel, she places near the IB M 727 Magnetic Tape Unit, then she walks to man behind the consol & hands him a clipboard with papers. Computer Room - Early IBM Computer Systems - 700 Series - IBM 702 Data Processing System MSs young man in suit seated behind the IBM 702 Central Processing Unit operator's console (housed in yellow), he begins punching buttons to enter data, printer begins to move then the magnetic tape in BG begins to spin. Scale Model of Computer Room - Archival film documenting the early collaboration of computers & business technologies. MS three Caucasian male business executives standing behind detailed scale model of computer room, man in center points at the model while talking, the model details IBM data processing machines & mainframe storage towers. Computer Panel CU colorful computer lights flashing (blinking) on panel. Various shots, pans and medium shots of red lights lit on computer panel board. CU computer animation of Coca Cola logo. MS woman changing reel tape on punch card machine, second woman seen stocking blank punch cards in machine. MCU IBM machine sorting punch cards. CU IBM 716 Alphabetic Printer (housed in yellow). CU IBM 721 Punched Card Recorder (housed in yellow), man reaches in and pulls punch card from machine. GV men in business suits inside colorful computer room outfitted with the latest in IBM computer systems, one man sits in front of the 704 operator's panel while the other walks around monitoring the 711 Punched Card Reader then 716 Alphabetic Printer. Great MS young man in suit seated behind the IBM 702 Central Processing Unit operator's console (housed in yellow) looking over paper on clipboard, second man walks into frame & hands him some more papers, with this the man behind the consol begins punching buttons to enter data, printer begins to move then the magnetic tape in BG begins to spin. Great MS young man in suit seated behind the IBM 702 Central Processing Unit operator's console punching buttons, young woman walks by & hand him a clipboard, man continues entering data, printer begins to move, magnetic tape in BG begins to spin. IBM Punch Card Reader Machine CU IBM punch card reader in action, female hand pushes buttons setting the punched cards in motion, data is recorded onto punched ribbon which is wound onto reel. Old Printer CU old printer as numbers are printed on paper. Computer Room MS men inside computer room filled IBM processing machines, one man works a punch card machine while the other changes out some sort of memory panels.